Opera 10.5x for Linux doesn’t seem to be evolving at the rate that I had originally expected as I interpreted from several Desktop Team blog posts, but it does seem to be inching its way forward on the stability end of things. After seeing the improvements that were made to Opera 10.5 for tab bar in Windows XP I thought anything was possible. 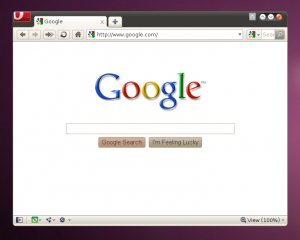 I’ve tried to recapture this implementation in what I think it would look like in Ubuntu if implemented similarly. 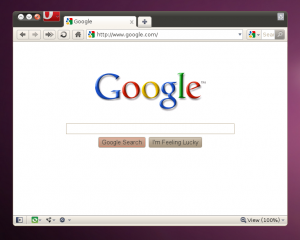 This is a very slick and clean approach much like Windows XP, Vista and 7 are now with Opera. This is an example of how Opera would look in a default Ubuntu 10.04 since the window controls are on the left. While the the images above are both simple and crude mockups, they do show that the same implementation would work well into the Unix and Linux platforms. Obviously the first image (window controls on the right, like Microsoft Windows) is the most elegant of the two. The second image (window controls on the left, like Mac) is functional, but not the most aesthetically pleasing solution. One alternative that I can easily fathom is simply detecting the “window control button orientation” and in this case rendering the Opera-menu on the right side of the title bar with the trash can icon to the immediate left. In more basic terms, swap the window controls and the Opera-menu in the first image and there you have it. 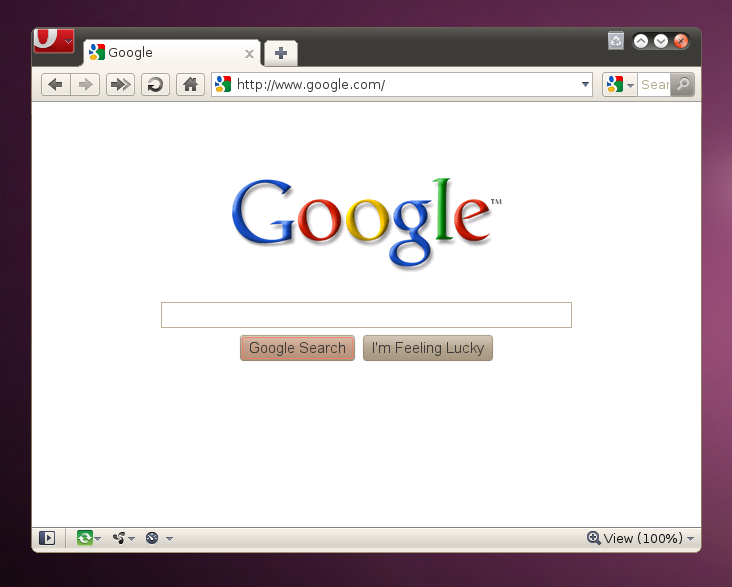 An example of how the title bar can still look very clean when switching the window controls and Opera-menu. Theres no reason that I can think of that the Opera-menu should be sentenced to spend the rest of its life on the left side of the window. The main menu buttons in Internet Explorer and Google Chrome, while not located in the title bar, are located on the right side of the browser window. Just some food for thought. Hopefully I jar some ideals and better alternatives. EDIT: Went back and made the third mockup since explaining it might not have been clear before. Enjoy. Great work you’re doing. You should file a bug (feature request) and link back here. Give those devs some ideas. Can you teach us how to integrate title bar with tab bar? The examples above are only modified images to show what it would look like. I keep hoping that they will eventually implement this. If they release Opera 10.5x without this then I will begin working on options to accomplish this, but until then we should wait to see what they do. Previous Previous post: Want cool desktop stats? -> Conky!